Geometric Mean of Similar Triangles : The altitude to the hypotenuse of a right triangle forms two triangles that are similar to each other and to the original triangle. Since these triangles are similar, we can establish proportions relating the corresponding sides. Two valuable theorems can be formed using these proportions. Given : A right triangle ABC, right angled at B. BD ⊥ AC. The altitude to the hypotenuse is the mean proportional between the segments of hypotenuse. 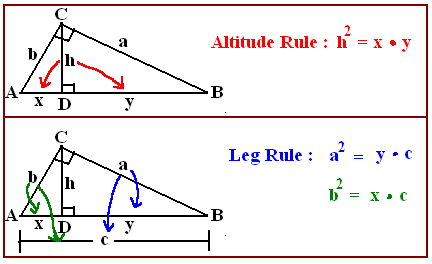 Either leg of the given right triangle is the mean proportional between the hypotenuse of the given right triangle and the segment of the hypotenuse adjacent to that leg. Problem 1 : If AD = 3 and DB = 9 find CD. Problem 2 : If AD = 3 and DB = 9 find AC.